Poncho Sanchez is understandably proud that he will be presented with a Lifetime Achievement Award at the Latin Grammy Awards on Nov. 14 in Las Vegas. The 61-year-old percussionist, singer and band leader will be honored alongside actress Rita Moreno and such international music greats as Brazil’s Milton Nascimento and Spain’s Luz Casal. Yet, despite having 27 solo albums to his credit, Sanchez still pinches himself that he makes a living doing what he loves most. Never mind that this Grammy Award-winner has collaborated with such jazz, pop and Latin music icons as Ray Charles, Freddie Hubbard, Booker T. Jones, Mongo Santamaria and Cal Tjader, with whom Sanchez launched his career in 1975 with a week-long residency at Tom Ham’s Lighthouse on Harbor Island. 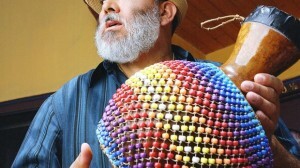 “I never dreamed I’d make a career out of this,” said the bearded conga player, who performs here Saturday and Sunday at downtown’s all-ages Anthology. Happily for his fans around the world, music has long been his day (and night) job. On his latest album, “Live in Hollywood,” he and his brassy, eight-man band repeatedly ignite. The nine-song release on Concord Records mixes percolating Sanchez originals with charged reinventions of classics by Santamaria, Cuban music icon Mario Bauza, former Tjader band pianist Clare Fischer and blues guitar great Albert King (whose “Crosscut Saw” snaps and crackles anew to a zesty cha-cha rhythm). Over the years, Sanchez has performed with orchestras (including the San Diego Symphony) and has put his percussive stamp on songs from across the American and Afro-Latin music spectrum. But he has never strayed far from his greatest aural passion. “I grew up with soul and blues, and I loved them,” he said.